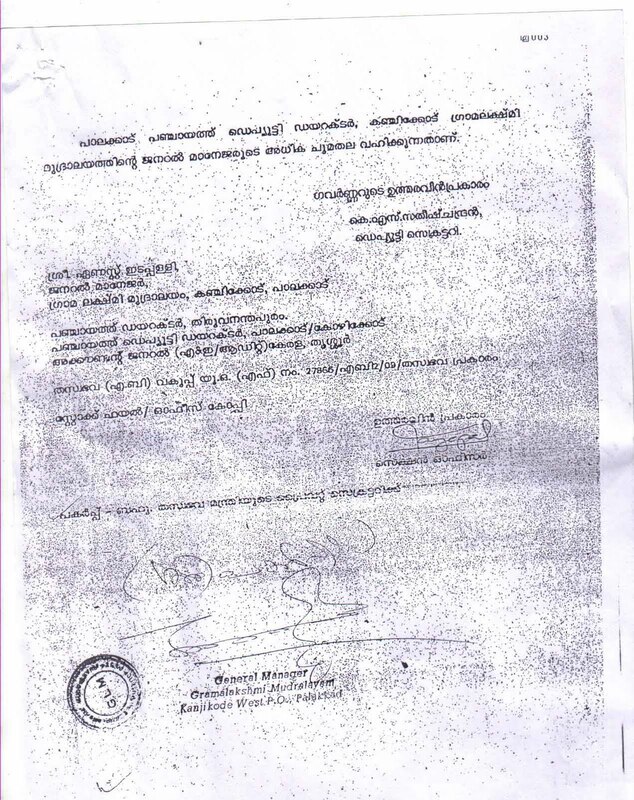 Below is the notice sent to Bishop K P Kuruvilla, to remove people who have no Christian character and experience from the governance of the church. This is with regard to Earnest Edapally, who is a executive member and working committee of the CSI north Kerala Diocese. He was found guilty of economic misappropriation, tampering of govt records, forgery and fabrication of govt. records, to cover up the misappropriation. And is suspended from govt. service as on June, 2009. Please find the Surspension, by order of Governer of Kerala. A notice was issued by Mr. T J John of Holy Trinity CSI church, College hill, Aluva, Kerala, for his removal from the said bodies of the church as per the provisions of the constitution of the Church of South India. 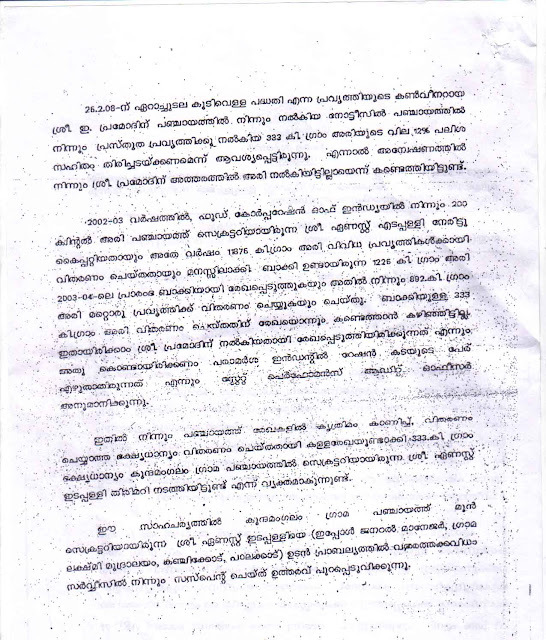 Kindly refer to the constitution of diocese of north Kerala in the church of south India, printed as authorized and approved by the diocesan council held on 10 February 2009 and published by north Kerala diocese, CSI diocesan office PB no 104, shornur, Kerala – 689121 and printed at west life advertising, convent road Calicut – 32, and is claimed to be in force effective from 10 February 2009 of which copies are yet not available either in the diocesan office or in the book shops, or with the church authorities or congregation. This has reference to Shri. Earnest Edapally, diocesan council member, executive member and the working committee member and also a close accomplice of your good self. In his capacity as Kunamangalam panchayath secretary, in the year 2002-2003 he had misappropriated 333 KG of rice meant for food against work for Govt. of Kerala, fabricating and tampering with the panchayath records. The Kerala state performance and audit officer verified and an enquiry is conducted and Shri. Earnest Edapally is found guilty and he is suspended from the govt. job as panchayath secretary with immediate effect by Govt. order no. 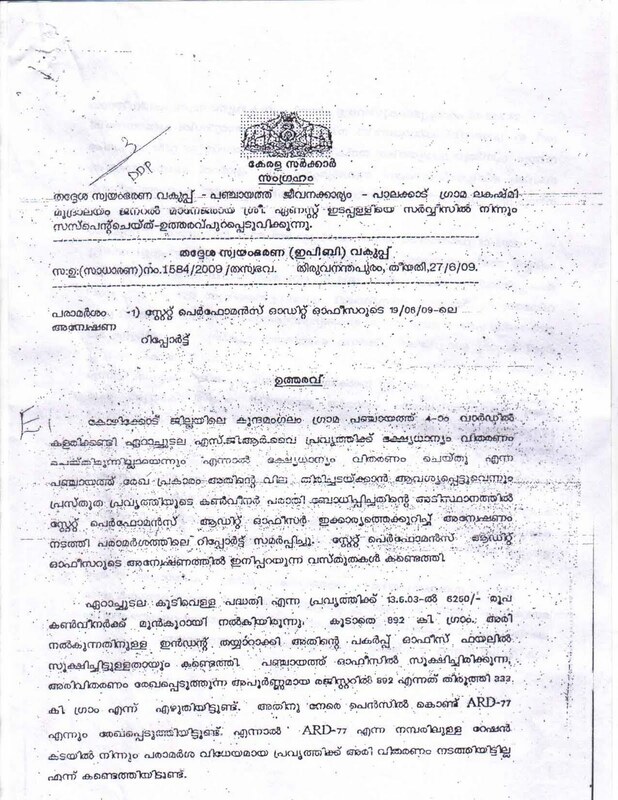 1584/ 2009 of 27-06-09 by order of governor of Kerala. The order copy is enclosed with. By his action, he has forfeited his right to be a member of diocesan council by the constitution chapter 5 rule 35 read with rule 28 and chapter 2 rule 9 A. Consequently he has forfeited his membership in the executive and the working committee. Kindly treat this letter as an instrument of exhaustion of remedies as described in chapter 8 rule 3 before approaching appropriate court of law. Hence a reply of compliance of the constitution is required within 7 days from the receipt of this letter. Kindly act expediently and urgently since the matter is of purity of the church under chapter 8 rule 77 of the constitution. who is this Earnest Edapally?